2005 PHOTO PRINTS AVAILABLE from 50p + P&P. If you didn't get to the 2006 race you can still get them by post. Hutton Roof and Farleton Knott are covered with a maze of footpaths. Navigation is a real problem on a misty day so this race has always been flagged from start to finish. I am pleased to hear favourable comments about the way marking of the route, especially if it encourages runners who are sometimes a little daunted by micro navigation. The crags race is about fun and above all cakes! Lee Siemazsko takes the competion seriously, however and reconnoitred the route on Friday night to be sure of a problem free race on Saturday. He won easily in a time of 47.16 but was disappointed not to have been closer to Mark Croasdale’s record of 43.38. There was quite a tussle for the next three places with Darren Kay, Horwich 48.04 leading home Sean Bollend, Bowland 48.10 and Phil Davies Borrowdale 48.32. 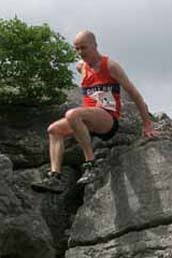 First V40 was Graham Patten, Ambleside 50.44 followed by an excellent performance from local runner Mike McKenna 58.48 and 1st V50. 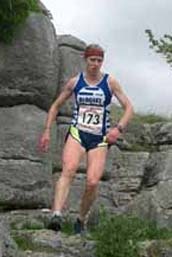 When Dennis Kearns 1st V60 finished in 62.02 I began to wonder whether I would ever race this route again! Not as many women ran this year but, as one competitor remarked, “we would have won the team prize but she had to stay in the tent to stop it from blowing away!” First lady was Vic Wilkinson, Bingley in 52.32. followed by Rebecca Robinson Kendal 55.57 and Hazel Jones, Dallam 59.30. 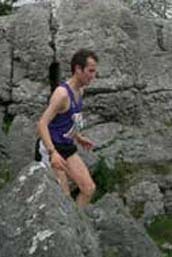 Nicola Davies completed the Borrowdale team and took the 1st veteran 40 prize in 59.44. Wendy Dodds Clayton Le Moors took her customary V50 prize and was disappointed not to have her V50 ladies team with her to claim the team prize. The junior races were keenly contested as always and many young competitors went on to compete in the sack race etc. in the village Fete as well. Mum’s and Dads not in the Senior race enjoyed the stalls outside and even sampled the best cakes before the senior race finished. Looking at the glazed eyes of runners scoffing cakes at the finish, it was clear that the wind had made the route a little bit more of a challenge this year. The strong winds on the day destroyed our registration tent but the cow trailer was an excellent substitute and more in keeping with the village atmosphere we are trying to promote at this event. Once again all proceeds will go to the village Hall and its new disabled Toilet!